Want to lift your practice to a whole new level? Become one of Dr Moffet’s private coaching clients. With clients stretching over three countries and five time zones, Dr Moffet coaches Dentists on a one on one basis to achieve their desired outcomes for their practices. If you’re interested in near doubling your collections in an eighteen month period of time, like Dr Rachel Hall from Brisbane did, then you owe it to yourself to make contact with Dr Moffet to see how his private coaching will benefit you. The truth is, there are LOADS of things going on in your practice, that are costing you money… that you have absolutely NO idea about — simply because you don’t have a plan. Or, if you have one, it focuses on office staff convenience, and not the Ultimate Patient Experience. And unless you have some kind of system with specific procedures in place….. 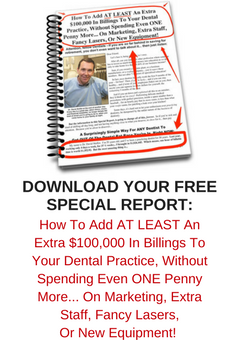 Learn the reasons why some dentists never get the results they want and are constantly suffering, struggling, and being held hostage by their practice… while others seem to make money easily and are off enjoying their practices, their family… and their lives. Take your Dental Practice to a higher level by getting exclusive access to 1-on-1 support each month from Dr. Moffet via a library of monthly newsletters, informative videos and monthly Q&A calls and recordings. Three in depth interviews of Dr David Moffet conducted by Dental Gurus, Dr David Madow, Dr David Phelps and Duane Tinker. In these interviews Dr David Moffet shares his philosophy and journey to creating the Ultimate Patient Experience. Does your Dental Office Phone need to be answered better? Then find out how to achieve Dental Phone Excellence right here.